Sixteen years ago, the Oracle of Omaha issued a warning about interest rates and corporate profits. Applying that warning to today's stock market could help you avoid losses. NEW YORK (TheStreet) -- Warren Buffett of Berkshire Hathaway (BRK.A (BRK.B doesn't often opine on the value of the stock market or its likely direction, but he did so in 1999, near the height of the technology bubble. In a November 1999 Fortune article co-authored by Carol Loomis, Buffett explained frothy markets as follows: "The fact is that markets behave in ways, sometimes for a very long stretch, that are not linked to value. Sooner or later, though, value counts." "(1) Interest rates must fall further. If government interest rates, now at a level of about 6%, were to fall to 3%, that factor alone would come close to doubling the value of common stocks. Incidentally, if you think interest rates are going to do that -- or fall to the 1% that Japan has experienced -- you should head for where you can really make a bundle: bond options. "(2) Corporate profitability in relation to GDP must rise. You know, someone once told me that New York has more lawyers than people. I think that's the same fellow who thinks profits will become larger than GDP. When you begin to expect the growth of a component factor to forever outpace that of the aggregate, you get into certain mathematical problems. In my opinion, you have to be wildly optimistic to believe that corporate profits as a percent of GDP can, for any sustained period, hold much above 6% [emphasis added]. One thing keeping the percentage down will be competition, which is alive and well. In addition, there's a public policy point: If corporate investors, in aggregate, are going to eat an ever-growing portion of the American economic pie, some other group will have to settle for a smaller portion. That would justifiably raise political problems -- and in my view a major reslicing of the pie just isn't going to happen." The third thing Buffett cited was superior portfolio management, which is extraordinarily rare. Buffett predicted the market would not "come close" to the 12.9% next-20-year annual return expectation of professional money managers polled at the time. Buffett's prediction proved accurate. In fact, not only was the 12.9% expectation missed, annualized real returns for the S&P 500 were negative 4.9% in the 10 years following the publication of the Fortune article, and just 0.2% per annum through June 27, 2015, including dividends. So how do the Buffett value drivers look today in comparison to 1999? 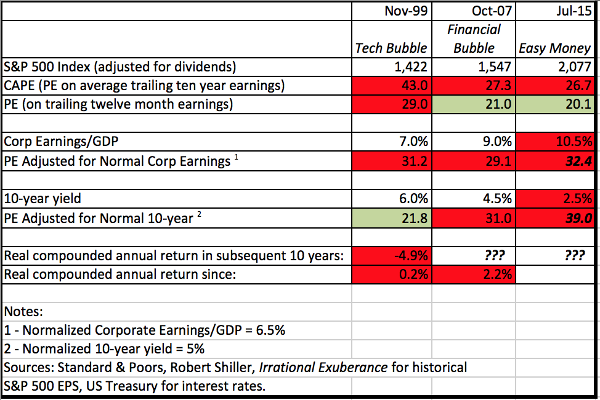 Table 1 shows that both interest rates and corporate profits point to far more ominous prospects looking forward today than they did before the tech bubble and the financial crisis. Let's use a cyclically adjusted price-to-earnings ratio, or CAPE (the S&P 500 index divided by trailing 10-year average earnings) and the price-to-earnings ratio (or P/E) on trailing 12-month earnings as baseline proxies for market valuation. We can see that the current stock market does not look as expensive as it did before the tech bubble burst or the financial crisis. Still, it has the third highest level of CAPE in history. If we adjust the earnings component of the price-to-earnings ratio to reflect lower "normal" corporate profit margins, and do the same adjustments for the P/E ratios for those other market bubbles, then today's P/E is higher than those for 1999 and 2007 (32.4 vs. 31.2 and 29.1, respectively). Buffett was extremely skeptical of corporate profit margins holding above 6% for very long. In truth, they have been above 10% for three years running. Since 2009, corporate profits have grown 8.7% per year, while GDP has risen 3.9% and the S&P 500 index 20.1%. As Buffett pointed out, "The inescapable fact is that the value of an asset, whatever its character, cannot over the long term grow faster than its earnings do." Meanwhile, interest rate levels point to an even more treacherous future for equity markets than in either 1999 or 2007. The historical average yield on the 10-year Treasury is just over 5%, twice the current level. Assuming all other drivers of the stock market's valuation remain the same, the impact of a 2.5-percentage-point increase in the rate at which the market discounts the long-term earnings of the S&P 500 suggests more than 30% downside for the index from recent levels. The same adjustment made to the P/E ratios in 1999 and 2007, in addition to the adjustment made for normalization of corporate profit margins, suggest that the current market is significantly more expensive than either 1999 or 2007. Taking into account those adjustments, today's market is valued at 39 times trailing 12-month earnings per share, vs. 21.8 for 1999 and 31 for 2007. The 1999 valuations at least had the incremental support implied by the normalization of rates from 6% to 5%. Today we are going in the opposite direction, from 2.5% to 5%. A current P/E ratio adjusted for the normalization of both rates and corporate profit margins of 39 portends a rough go for U.S. equities over the next 10 years. The factors cited by Warren Buffett in his prophetic call back in 1999 paint a far more worrisome picture today looking ahead to the next 10 years. It's not worth making short-term market predictions here, but it's likely that equities will avoid a major correction (of more than 20%) until the yield on the 10-year Treasury is at least 1.5% higher. That probably won't happen for a while, but the eventual reckoning will not be pretty.